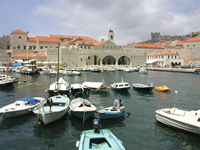 Old Port Dubrovnik is located at the Eastern part of the City. The port is encompassed by two breakwaters: breakwater Porporela in front of St. John fortress and Kaše breakwater going perpendicular across the port bay. In the time of the Dubrovnik Republic several forts protected the port: St Luke Fort, St John fortress and Revelin fortress. Today the port is a safe haven for many private boats of local citizens. Alos regular boat line to Lokrum island departs from the Old Port, as well as the boat lines to Cavtat, Mlini, and various sightseeing boat tours. The most important architect in the development of the Old Port Dubrovnik was Paskoje Miličević, a master architect of the Dubrovnik Republic since 1466. Already In 1470 he had built a low bastion leaning against the Fort of St. Luke at the entrance to the port. 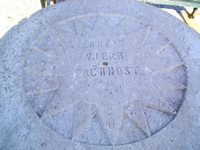 The construction work in the port of Dubrovnik made him famous. In the 15th century he built the breakwater - "Kaše" which provided additional protection for the ships in the port. Before the breakwater was built a chain had been put up in the evenings between the St John fortress and the St. Luke fortress to protect the port from enemy vessels. The breakwater provided also additional protection from the enemy as the chain was now put on a much shorter distance, between the St. John fortress and the breakwater. Additionally Miličević arranged the Ponta gate in the port and the port project was finalized in the beginning of the 16th century as a sloped part of the wall had been made along the Fortress of St. John. Later in the middle of 16th century St. John fortress was merged with the bastions and the neighbouring port to form its present state. Amidst the Old Port there is a building with three simetrical vaults, that is the old Arsenal, a place where ships were built in the time of the Dubrovnik Republic. The vaults would be sealed by bricks in the period the ship was built in order to avoid foreign spies noting shipbuilding secrets. After the ship was built, the brick wall would be demolished and the ship launched into the sea. Today Arsenal is arranged as a restaurant. However the whole ambiance of the restaurant is thematic as the interior decoration of the restaurant is made as if it were an ancient shipyard: all tables and seats are made of carved wood, several tables are enclosed in ship skeletons, davits are fitted high in the hall, and ropes are fitted through pulleys as if heaving in the ship builds. The shipbuilders of Dubrovnik were far known, hence ship built “in the manner of Dubrovnik” meant durable, strong and simple construction. In mid 16th century Dubrovnik owned over 180 large ships with total burden of 36000 kars (one kar=2/3 of tons). This fleet was valued at about 700000 ducats. In those times credit transactions and naval insurance brought great profits to Dubrovnik Republic as Dubrovnik passed law on naval insurance as early as 1568. 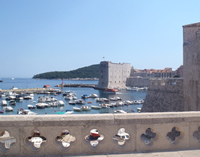 In the time of decline and recession of maritime trade in the Mediterranean, in the 18th century, caused by discovery of new sea routes, Dubrovnik still had consulates in over 80 cities. The fleet of Dubrovnik, including fishing boats, totaled 673 sailing ships, of which 255 larger ships sailed to foreign waters, and 230 were ocean ships. In the most glorious days the fleet of Dubrovnik equalled the fleet of Venice, but was incomparably weaker than the fleet of the Netherlands. Walkway along the port and breakwater Porporela was made in the 19th century during the Austrian rule of Dubrovnik. Breakwater Porporela is said to be a place of lovers as couples usually take romantic walks along this breakwater, sit down on the benches, and enjoy the sea splashing along the length of the breakwater. At the end of the breakwater stands a white stone bitt engraved with the wind rose displaying major winds. The bitt is a dedicated monument to Dubrovnik's seafaring tradition: The engraving says: "Znanje, Vjera, Srčanost" (Croatian) - (Knowledge, Faith, Prowess). Dubrovnik Port of Gruz is the commercial port of Dubrovnik. Today Dubrovnik is mostly a destination to cruise vessels, pleasure yachts, and occasional passanger liners. Port of Gruz is located about 3 kilimeters (1.5 miles) west of the City. When cruise vessel dock in the Port of Gruz passangers are mostly transferred by shuttle buses to the City. Sometimes cruise vessels anchor in front of the City, in the channel in between Lokrum island and mainland. 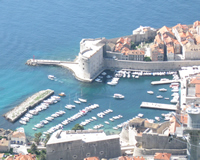 In that case passangers are tendered in by boats directly into the City via Old Port Dubrovnik.